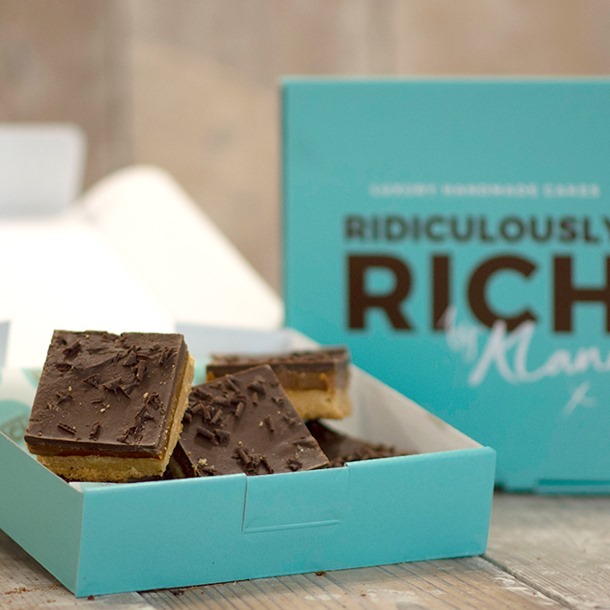 Our caramel slices cleverly combine a crumbly shortbread base with our own gooey caramel, a sprinkling of sea salt and dark Belgian chocolate. Cakey precision deliciousness. Salted caramel is so on-trend right now. People seem to love combining the sweetness of caramel with tastes from the opposite end of the flavour spectrum. 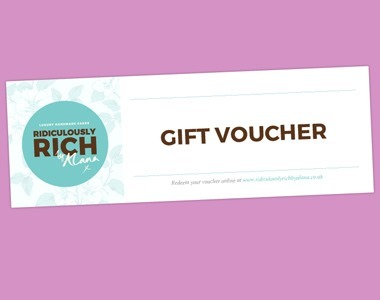 If you’re in the mood for a salty-sweet treat, a Salted Caramel Slice (or two) from Ridiculously Rich should tickle your taste buds in the best possible way. Our version of the moreish millionaire’s shortbread really is as rich as can be! These cakes have a shelf life of 10 days from the date of delivery when stored at room temperature. Top Tip: Slightly warm your caramel slice and serve with double cream for a magical moment of mmmm. Caramel (38%) (Sweetened Condensed Milk (Whole Milk Fat, Sugar), Glucose Syrup (Sulphites), Invert Sugar Syrup, Palm Oil, Butter (Milk), Sugar, Emulsifier: Mono - and Di-glycerides of Fatty Acids; Stabiliser: Pectin; Salt, Natural Flavouring), Fortified Wheat Flour (Wheat Flour, Calcium Carbonate, Iron Niacin, Thamin), Butter (Milk); Sweetened Condensed Milk (Sucrose, Milk Fat), Dark Chocolate (Cocoa Solids; Sugar, Cocoa Butter, Emulsifier: Soya Lecethin, Natural Vanilla Flavouring, Caster Sugar), Caster Sugar, Margarine (Vegetable Oil (Palm & Rapeseed), Water, Salt, Emulsifier: Mono - and Di-glycerides of Fatty Acids, Colourings: Annatto, Curcumin, Natural Flavouring), Course Sea Salt (0.2%).